VILLAS AND APARTMENTS TO RENT IN ALBOX, SPAIN. 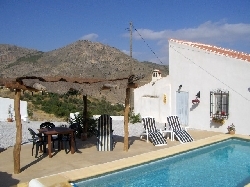 Welcome to our selection of holiday homes to rent in Albox, Spain. Albox is a traditional small market town in the Almeria province of Andalusia, named after the Arabic word for forest. There are several fiestas held in Albox throughout the year which features traditional dancing and cultural activities, with huge bonfires being held for Saint John's Feast on the 24th August with fireworks being set off, while on the 7th September, a religious pilgrimage starts from Albox to the Saliente Monastery 18km away. With more and more young people attending, the pilgrimage has become less about religion and more about partying. The other main fiesta in Albox is the All Saints Day Festival - this is an important agricultural event but has been losing its agricultural significance over the years and becoming a popular fiesta. Looking for self catering holiday accommodation in Albox? Then below is a selection of apartments in Albox and villas in Albox that can be rented direct from their owners. You can either click on each listing for further details or you can use our search engine on the left if you are looking for something in particular. Every week on a Tuesday, there is a popular Market that takes place and sells many kinds of items such as clothing, accessories for your home and a wide range of food from around the world. Albox has its own 10 pin-bowling centre just on the outskirts of the local town. Within the bowling centre there are 12 lanes, a range of arcade games, a bar and restaurant with pool tables which offers fun for the whole family. Albox is a market town located 130km from the provincial capital of Almeria. Albox is located between the towns of Baza and Huercal.